The Design Competition is over, and we can finally reveal the result of the community vote! We have 5 winners who will each be rewarded with a 1000 EUR cash prize. Congratulations! We have been really happy with the number of contributions to the contest, and their overall quality. Over the coming month, we have invited the 5 winners, plus two runner-ups, to continue the work on their respective proposals, as well as make drafts for three new pages – all of this as paid work. With this, we want to give them a chance to delve deeper into their own ideas for the site and to integrate feedback from users, without the stress and distractions of another popular vote. 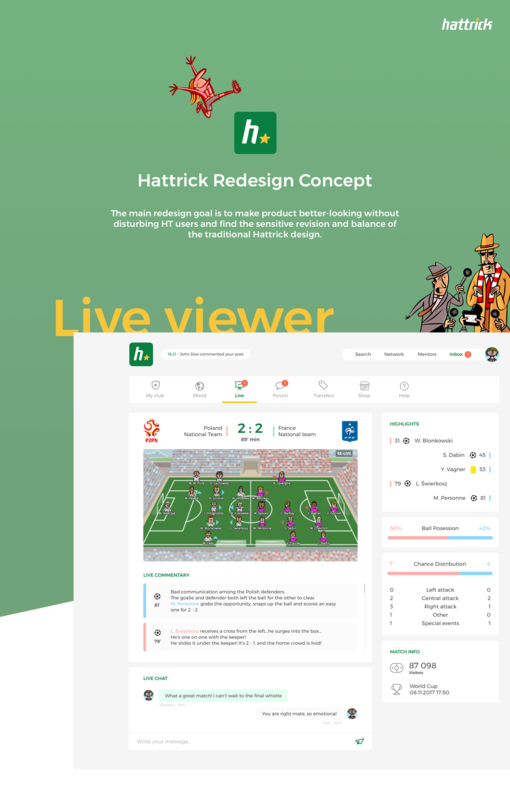 We also want to have our first opportunity to work directly together with them as well, learning more about them and their ideas, discussing the design of Hattrick in general. During this phase, we will keep one private forum for the designers and the HT team, but the designers will be free to engage with users through other forums if they so wish. We will open new threads in Global for this. 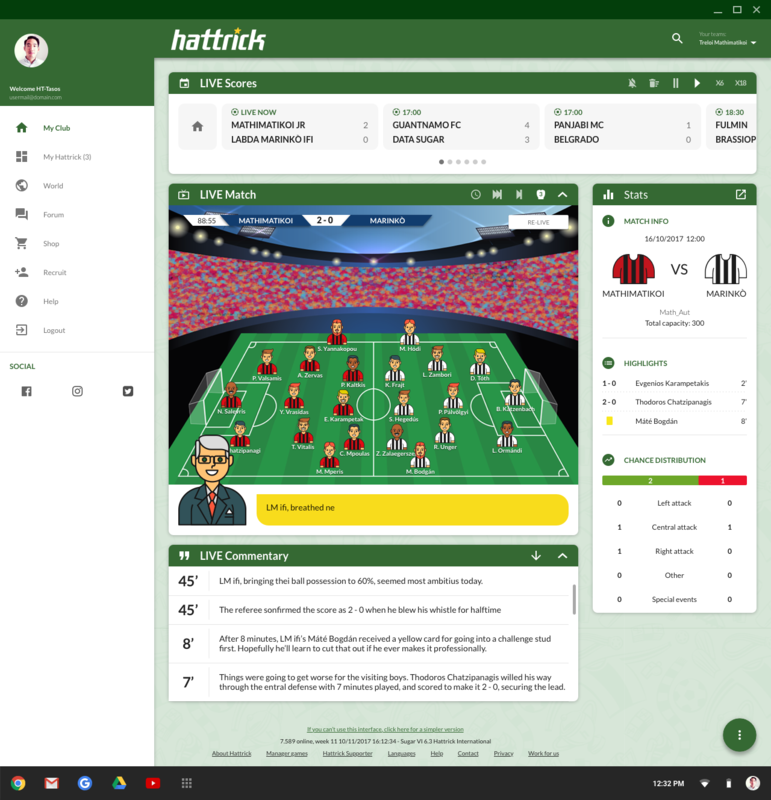 As can be seen from the winners of the popular vote, and also picked up from forum discussions, it remains very important to respect the legacy of Hattrick design in an effort to modernize the site. That is something we intend to honour. 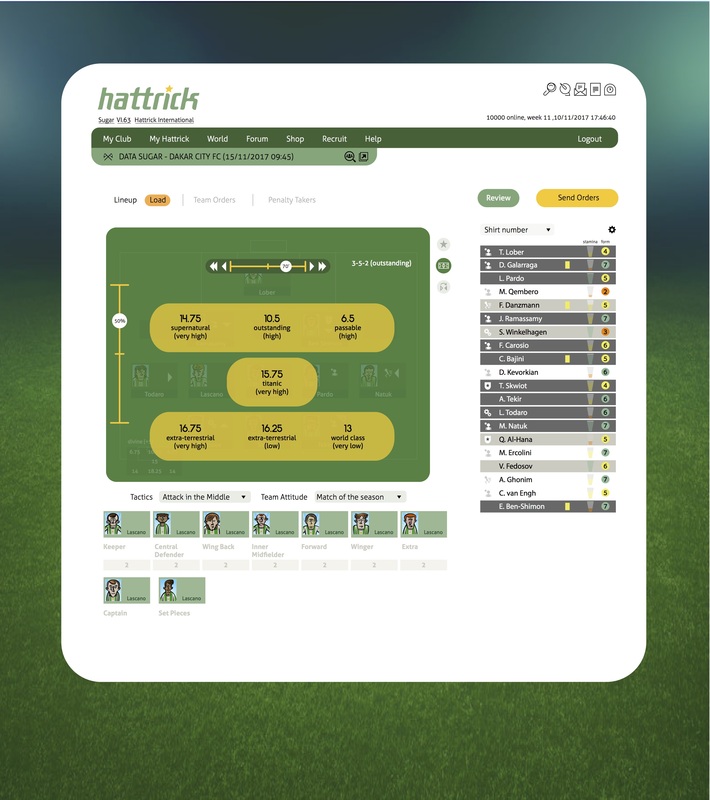 That said, having the chance to raise your focus for a while and test new ways to think about Hattrick design is really important, and I think that all the design work that went into this competition has served a purpose as points of reference in the continued development of our game. 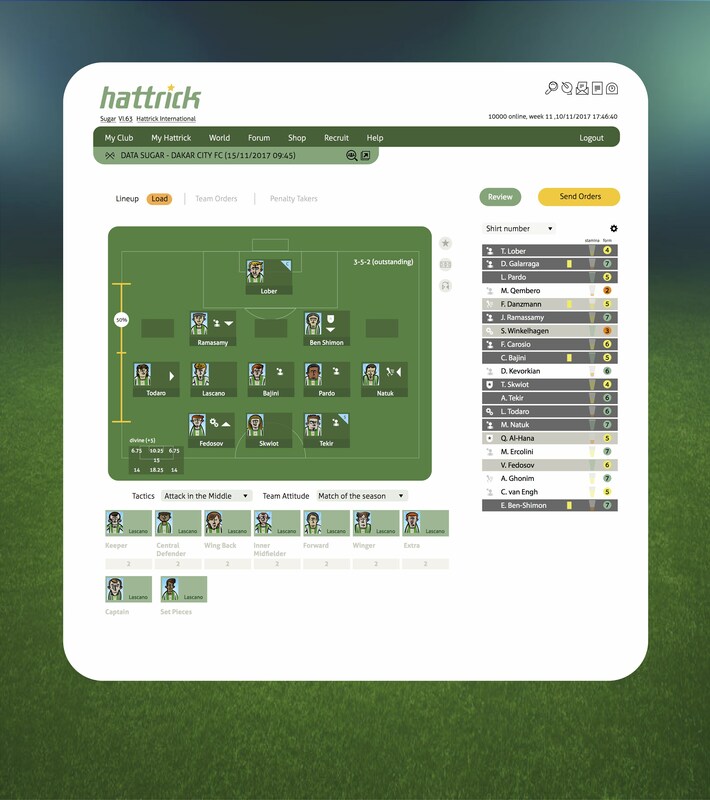 This proposal was one of few not made by an actual user of the site, but one who is a partner of a Hattrick manager. I think this stands out for its visual clarity, which allows the important things to stand out. There is also the transparent effects that make the whole site feels lighter, something I also think the new mono-coloured icons contribute to. In general, I think it is useful to question the clutter of symbols and information that we have on the site today, or at the very least make things more consistent than they are today. 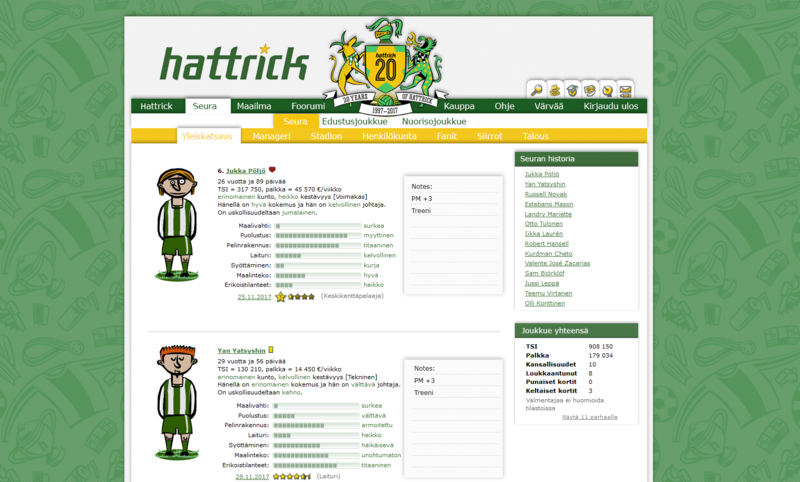 It will be interesting to see Yann direct his focus to some other pages on the Hattrick site. Alex Becker goes on the vertical in his lineup page, which is an interesting take on this page, allowing us to keep the 3D effect but getting a lot more space for the players. The subs are also moved to the left side of the field. 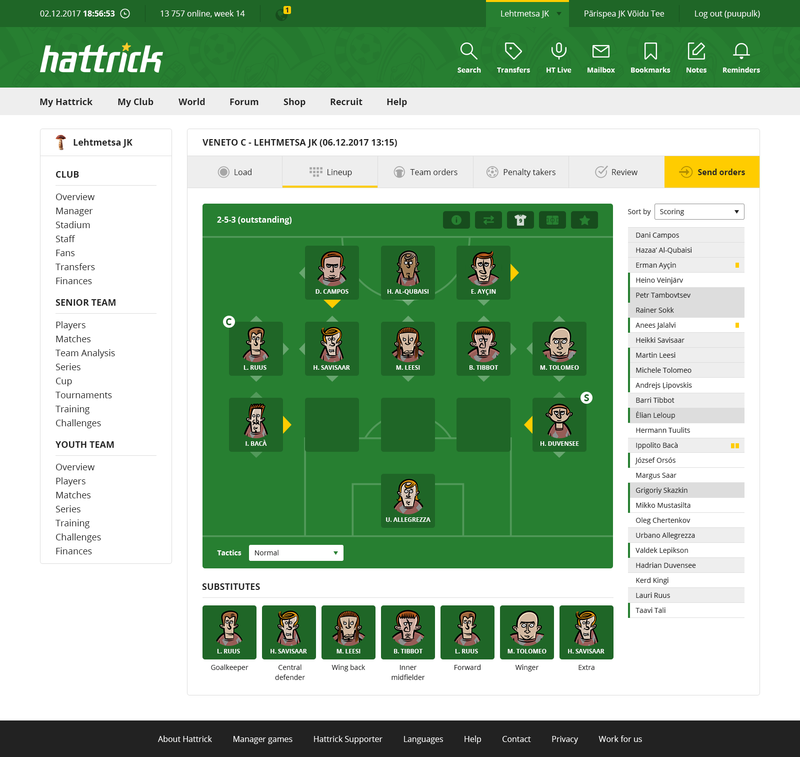 On the Live Page, there are some nice new ideas regarding the visualization of the team data, such as the form guide and the head to head. The Live header is probably too generous though – it makes the event window drop too low on the screen, something we have struggled quite a bit ourselves to prevent. 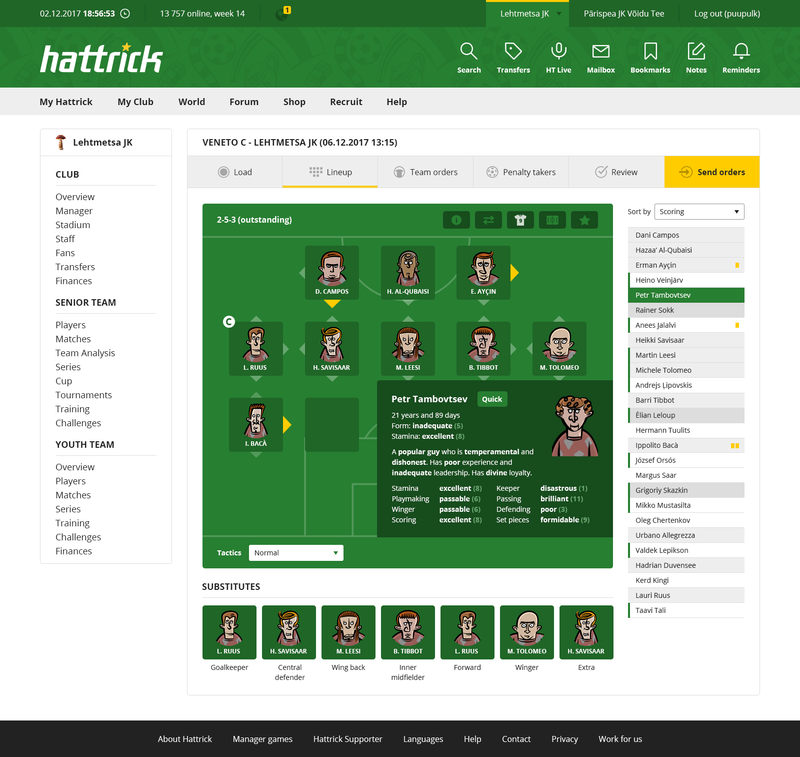 Marco Verri steps away from the “cartoony” Hattrick with his new player faces and what I interpret as a rather classic “PC football manager look” applied to Hattrick. 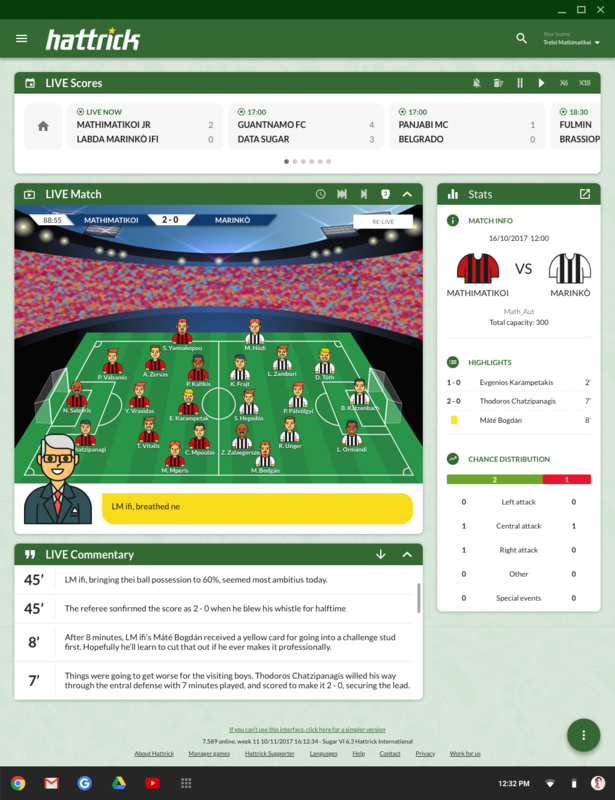 The new player cards with new ways to express form and stamina is a reminder that we didn’t succeed altogether with those in our most recent redesign of the Match Order page (which is one of the reasons we are having this competition after all!). 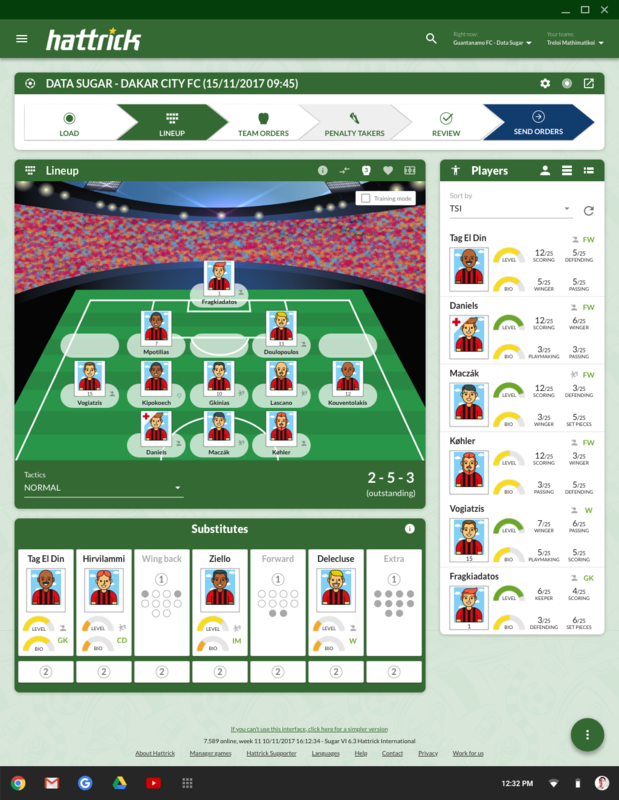 The 3D perspective on the Lineup and Match pages are retained, which does restrict the available space for placing and moving around players a bit. In the Finnish contribution, from Iikka Laurila, things stay quite close to the current design, but there are several new ideas as well. 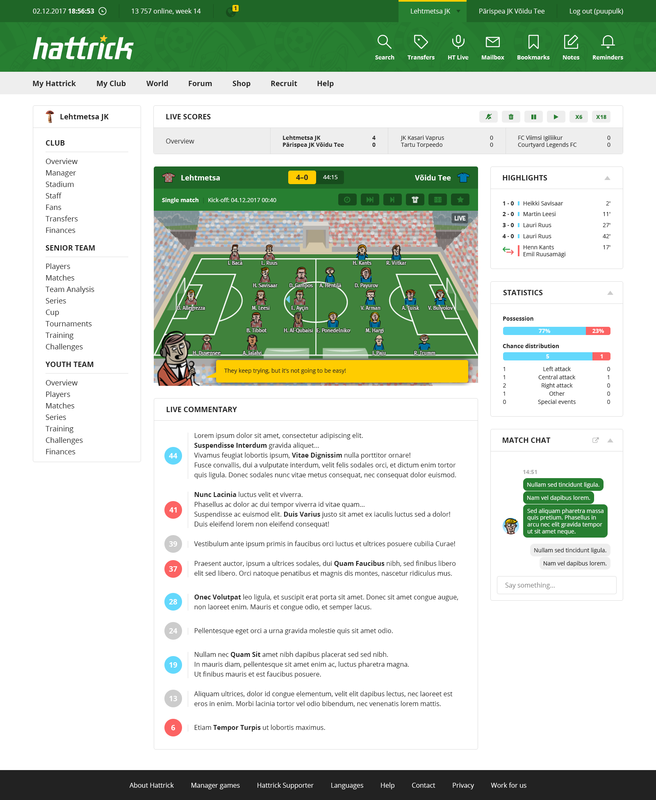 Especially the menu treatment – with several submenus replacing the left side menu – is eye-catching, and something that received favourable comments during the design vote forum discussions. How to “solve” the menu in such a way that users have the info they crave at their fingertips, while still “opening up” the page to content, is a key question for us. Eye-catching in this proposal was also the full figure player avatars and the “spider graph” for the skills. The top vote went to Ingmar from Estonia. It is in his own words “reactionary”, in the best sense of the word, a design that keeps the best from the old but still brings a modern feel. 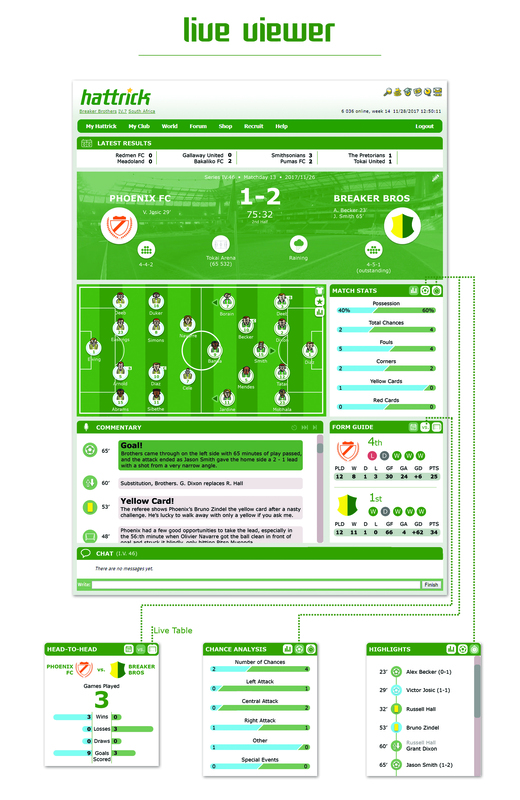 One thing that Ingmar does (and which we also see in the proposals of the #2, #3 and #5 designs, as well as in both runner-ups is a return to a flat design for the match lineup page. This is perhaps the clearest single conclusion we can already draw from the design process – a flat match order form is what users prefer, and this is not only a matter of taste, it also has objective advantages, such as better readability and more efficient use of space. Another thing we like here is the simple change to a white background, which we also see in some other designs. 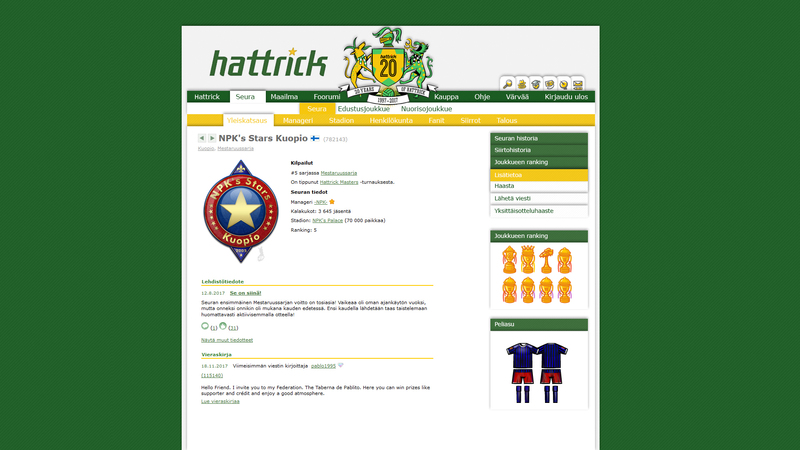 It allows the continued use of plenty of Hattrick green on the site, without it becoming overwhelming, as maybe it is to some today. Jesús Olano / also knows as LA-OReiDasSachadas, manager of Furons e sachadas S.A. The two runners-up finished just outside the Top 5, but we liked them a lot and the vote was close, so we wanted to keep them in the process for a while longer and see how they will continue their work. The Number 6 is our only staff member in the competition, Jesús Olano, who is one of our LAs in Spain. There are some similarities to the winning proposal in the treatment of text and the white backgrounds, and also in the choice to adopt our mobile icons into the menu (which others have done, too). This is an example of design ideas that we really love, we want to see ways to converge web and apps in a way that make sense to both sides, and we really think these menu icons would make sense on the web as well. The big idea in Jesús proposal is the bold use of horizontal space. It is true that we don’t use a lot of horizontal space on the web today, and doing it like this opens up a lot of interesting possibilities. Personally, I also like the colour choices, with the prominent green and careful use of a light blue for player cards and light green for the player list. The number #7, finally, is a contribution we expecting to see higher up. Perhaps stronger than anyone else, Piotr Bartoszek from Poland adapts the mobile design for the web, rather than the other way around. 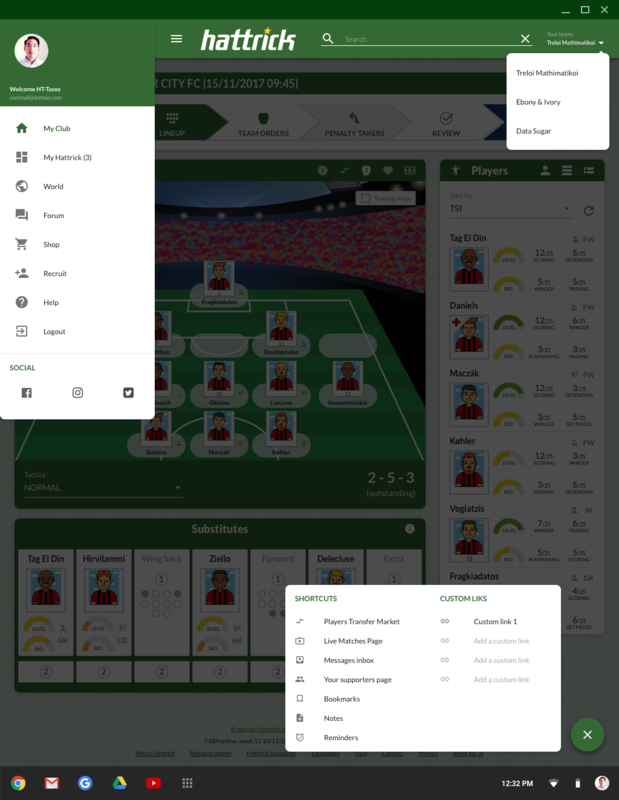 Again, we see the flat match page (which comes directly out of the app), and the mobile icons as well. The Live Viewer and menus are reminiscent of his fellow runner-up, Jesús, and the top vote, Ingmar. This is another really nice contribution and we are keen to see what else he, and the other 6 designs, can come up within the next month. A big thank you to all participants in the design competition as well as to all that voted! As predicted it became a popularity contest. The only thing that mattered was self-promotion on the forums and on FB groups, and the ugliest designs prevailed over the more worthy ones. Seems harsh. Where did you see this self-promotion? I didn’t notice anything on Facebook and the forum discussions seemed to take place in a single topic (“HT: Design Competition”) – most of the people posting there were “regular” users, not competitors. I’d say the results are consistent with the opinions expressed in the forums. 3 of the Top5 were my favourites, and the other 2 are not that bad. I didn’t notice any advertising in the HT Forums, and I’m not active on fb or twitter. The discussions I take part of were preferring more or less the same designs I prefer. Let me guess: You did one of the losing designs? How many votes did the other proposals get? Is it possible to have the full list? + later on can make where trainer/manager can give advice when to shot goal or give pass… That could do this game a lot better. Number 7 is by far the cleanest, IMO, best one. Quite disappointed it did not get higher. The proposed one month time well passed, when we will hear again about these designers and their work? When will the design change take place? I can read in HT that next year, but exactly when? Another question: These designs serve as a reference only or they be completely “transplanted” into the game?